Note: Shading does not indicate areas actually settled, but general extent of territories claimed. We have given some account of the ascendancy of France in Europe, the swift decay of the sappy growth of Spanish power and its, separation from Austria, and the rise of Prussia. So far as Portugal, Spain, France, Britain, and Holland were concerned, their competition for ascendancy in Europe was extended and complicated by a struggle for dominion overseas. The discovery of the huge continent of America, thinly inhabited, undeveloped, and admirably adapted for European settlement and exploitation, the simultaneous discovery of great areas of unworked country south of the torrid equatorial regions of Africa that had hitherto limited European knowledge, and the gradual realization of vast island regions in the Eastern seas, as yet untouched by Western civilization, was a presentation of opportunity to mankind unprecedented in all history. It was as if the peoples of Europe had come into some splendid legacy. Their world had suddenly quadrupled. There was more than enough for all; they had only to take these lands and continue to do well by them, and their crowded poverty would vanish like a dream. And they received this glorious legacy like ill-bred heirs; it meant no more to them than a fresh occasion for atrocious disputes. But what community of human beings has ever yet preferred creation to conspiracy? What nation in all our story has ever worked with another when, at any cost to itself, it could contrive to do that other an injury? The Powers of Europe began by a frantic «claiming» of the new realms. They went on to exhausting conflicts. Spain, who claimed first and most, and who was for a time «mistress» of two-thirds of America, made no better use of her possession than to bleed herself nearly to death therein. We have told how the Papacy in its last assertion of world dominion, instead of maintaining the common duty of all Christendom to make a great common civilization in the new lands, divided the American continent between Spain and Portugal. This naturally roused the hostility of the excluded nations. The seamen of England showed no respect for either claim, and set themselves particularly against the Spanish; the Swedes turned their Protestantism to a similar account. The Hollanders, so soon as they had shaken off their Spanish masters, also set their sails westward to flout the Pope and share in the good things of the new world. His Most Catholic Majesty of France hesitated as little as any Protestant. All these powers were soon busy staking out claims in North America and the West Indies. Neither the Danish kingdom (which at that time included Norway and Iceland) nor the Swedes secured very much in the scramble. The Danes annexed some of the West Indian islands. Sweden got nothing. Both Denmark and Sweden at this time were deep in the affairs of Germany. We have already named Gustavus Adolphus, the Protestant «Lion of the North», and mentioned his campaigns in Germany, Poland, and Russia. These Eastern European regions are great absorbents of energy, and the strength that might have given Sweden a large share in the new world reaped a barren harvest of glory in Europe. Such small settlements as the Swedes made in America presently fell to the Dutch. The Hollanders too, with the French monarchy under Cardinal Richelieu and under Louis XIV eating its way across the Spanish Netherlands towards their, frontier, had not the undistracted resources that Britain, behind her «silver streak» of sea, could put into overseas adventures. Moreover, the absolutist efforts of James I and Charles I, and the restoration of Charles II, had the effect of driving out from England a great number of sturdy-minded, republican-inspirited Protestants’, men of substance and character, who set up in America, and particularly in Now England, out of reach, as they supposed, of the king and his taxes. The Mayflower was only one of the pioneer vessels of a stream of emigrants. It was the luck of Britain that they remained, though dissentient in spirit, under the British flag. The Dutch never sent out settlers of the same quantity and quality, first because their Spanish rulers would not, let them, and then because they had got possession of their own country. And though there was a great emigration of Protestant Huguenots from the dragonnades and persecution of Louis XIV, they had Holland and England close at hand as refuges, and their industry, skill, and sobriety went mainly to strengthen those countries, and particularly England. A few of them founded settlements in Carolina, but these did not remain French; they fell first to the Spanish and finally to the English. The Dutch settlements, with the Swedish, also succumbed to Britain; Nieuw Amsterdam became British in 1674, and its name was changed to New York, as the reader may learn very cheerfully in Washington Irving’s Knickerbockers History of New York. 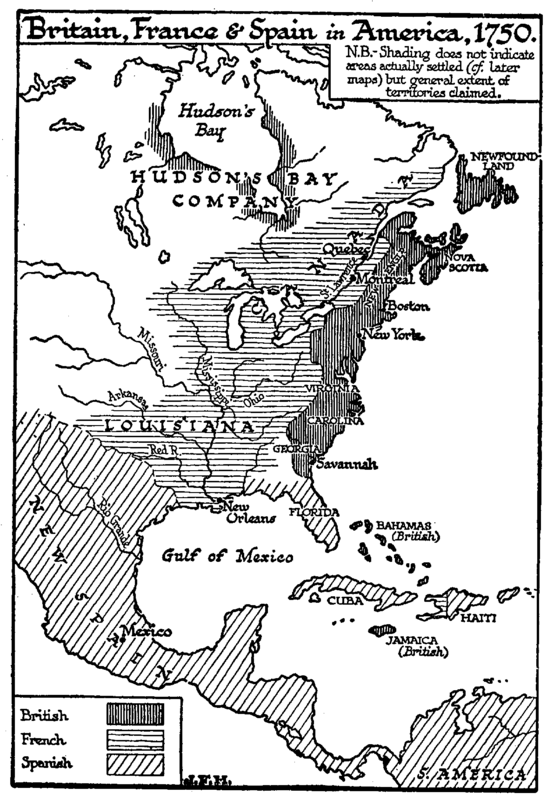 The state of affairs in North America in 1750 is indicated very clearly by a map we have adapted from one in Robinson’s Medieval and Modern Times. The British power was established along the east coast from Savannah to the St. Lawrence River, and Newfoundland and considerable northern areas, the Hudson Bay Company territories, had been acquired by treaty from the French. The British occupied Barbados (almost our oldest possession) in 1605, and acquired Jamaica, the Bahamas, and British Honduras from the Spaniards. But France was pursuing a very dangerous and alarming game, a game even more dangerous and alarming on the map than in reality. She had made real settlements in Quebec and Montreal to the north and at Now Orleans in the south, and her explorers and agents had pushed south and north, making treaties with the American Indians of the great plains and setting, up claims without setting up towns right across the continent behind the British. But the realities of the case are not adequately represented in this way. The British colonies were being very solidly settled by a good class of people; they already numbered a population of over a million; the French at that time hardly counted a tenth of that. They had a number of brilliant travelers and missionaries at work, but no substance of population behind them. Many old maps of America in this period are still to be found, maps designed to scare and «rouse» the British to a sense of the «designs of France» in America. War broke out in 1754, and in 1759 the British and Colonial forces under General Wolfe took Quebec and completed the conquest of Canada in the next year. In 1763 Canada was finally ceded to Britain. (But the western part of the rather indefinite region of Louisiana in the south, named after Louis XIV, remained outside the British sphere. It was taken over by Spain; and in 1800 it was recovered by France. Finally, in 1803, it was bought from France by the United States government.) In this Canadian war the American colonists gained a considerable experience of the military art, and knowledge of British military organization that was to be of great use to them a little later.